I can’t fix the economy. I can’t create more jobs. If I had to vote tomorrow, I’d never untangle the prolific muddle that is the current slate of presidential candidates. World hunger? Seems overwhelming. Climate change? Ditto. 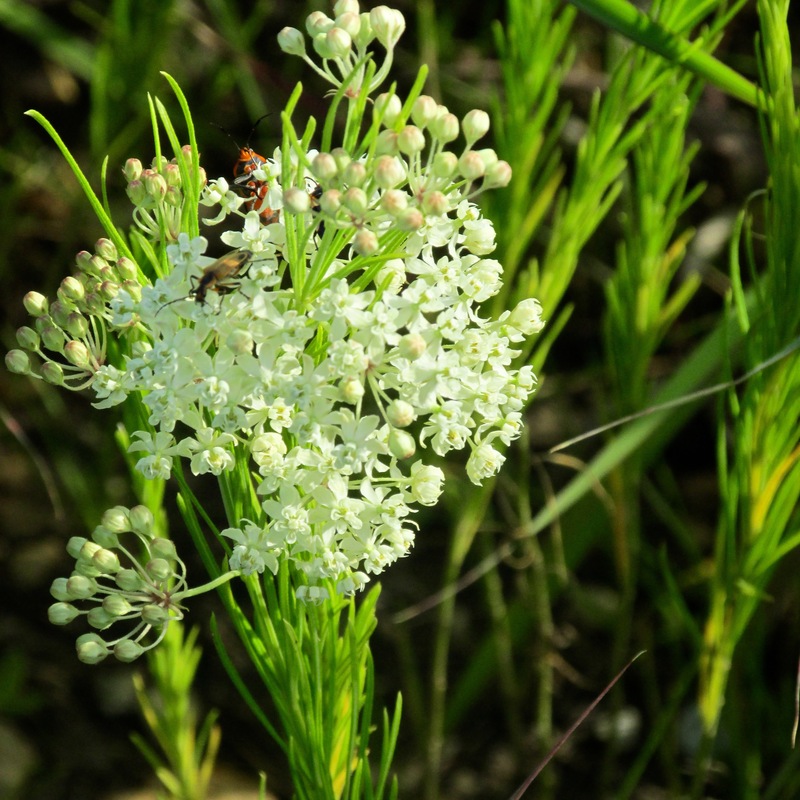 But there is one small thing I can do to make a difference this summer: Plant milkweed. 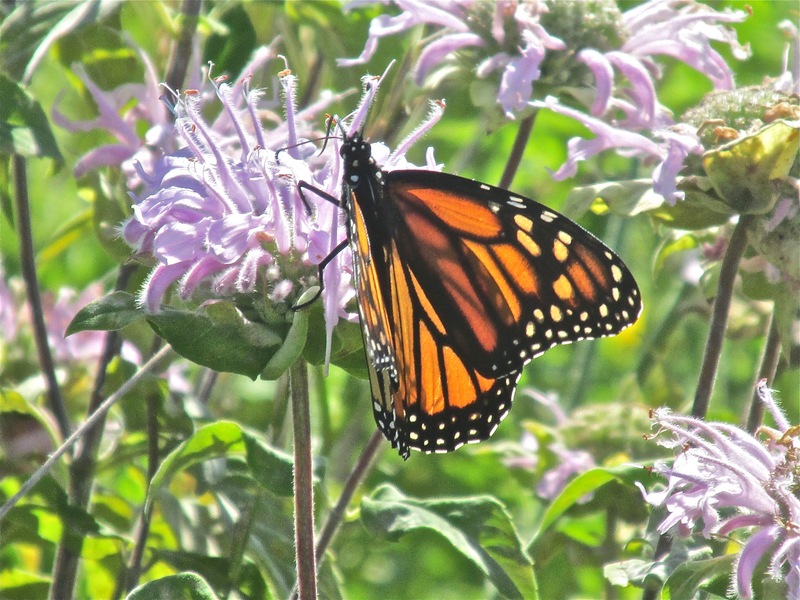 If you missed the news, monarch butterflies are losing numbers. Big numbers. 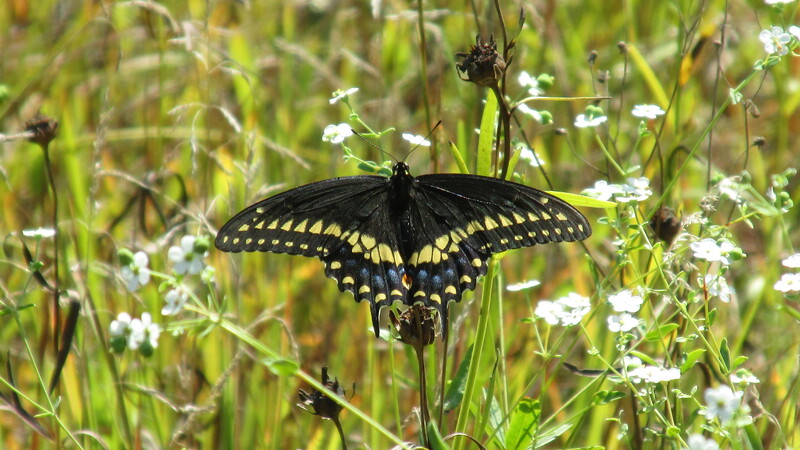 Agricultural land use, pesticides, and loss of habitat have decimated their populations. 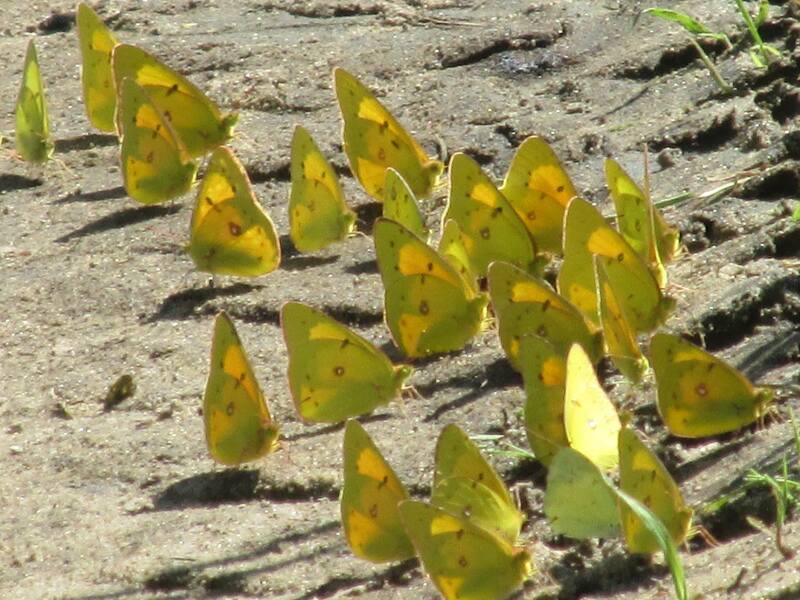 Monarchs are tattered. Fragile. Barely holding on. Plant flowers. Milkweed, to be specific. 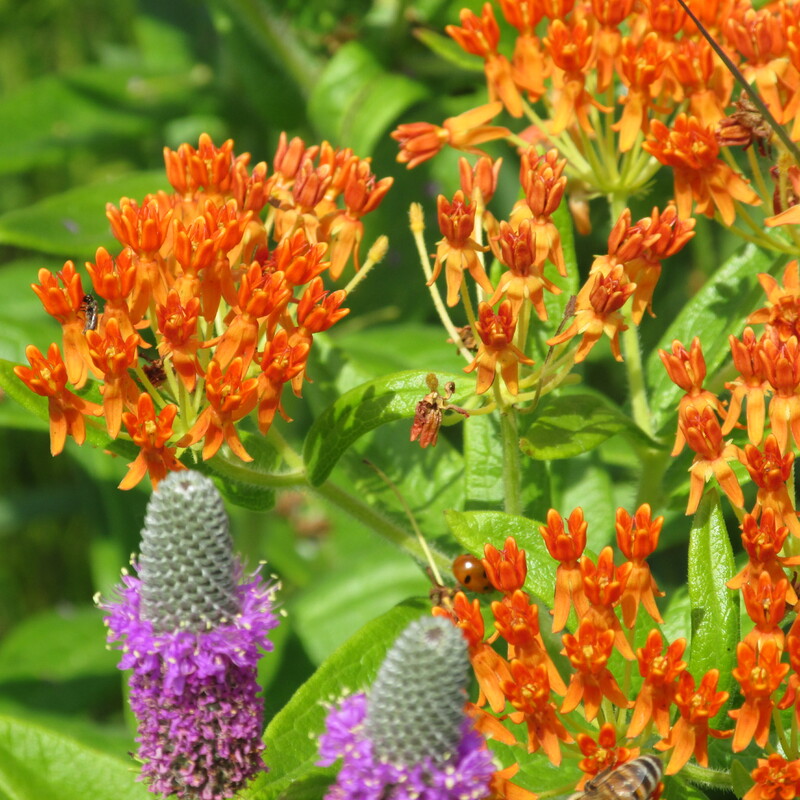 Here in Illinois, we have more than a dozen native milkweeds. Some are the familiar common pink, sweetly-scented globe-shaped blooms. 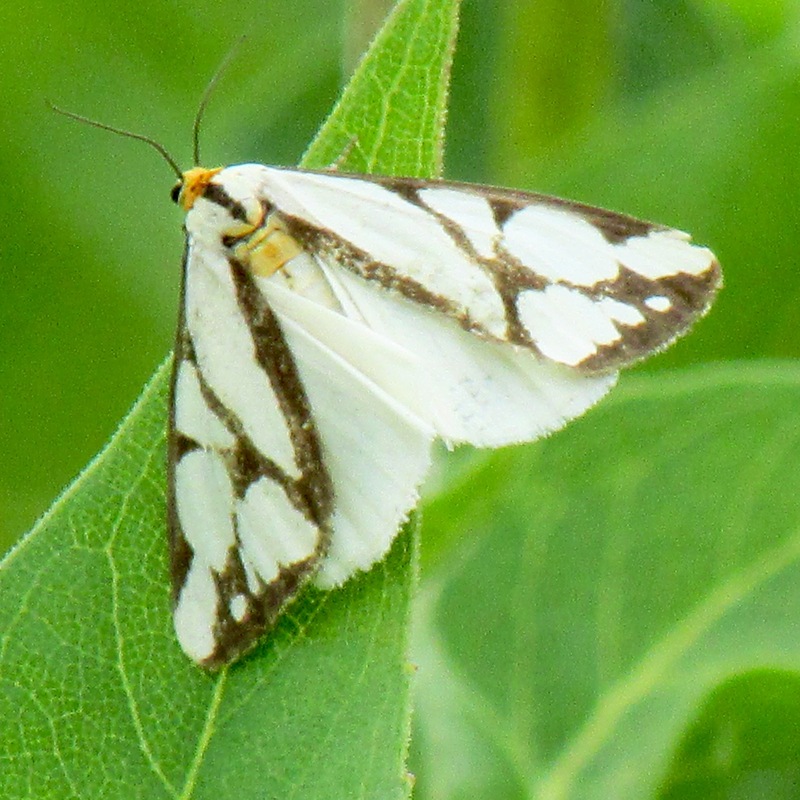 Others are quite different, such as this whorled milkweed. 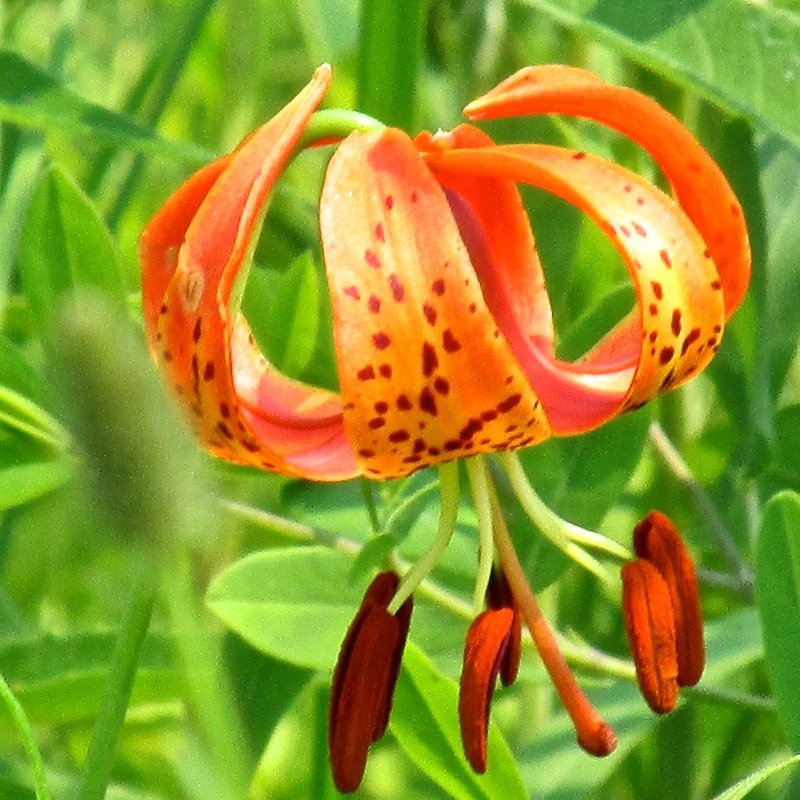 I love the bright orange butterfly weed, also in the milkweed family. Think how pretty it would look in the garden! 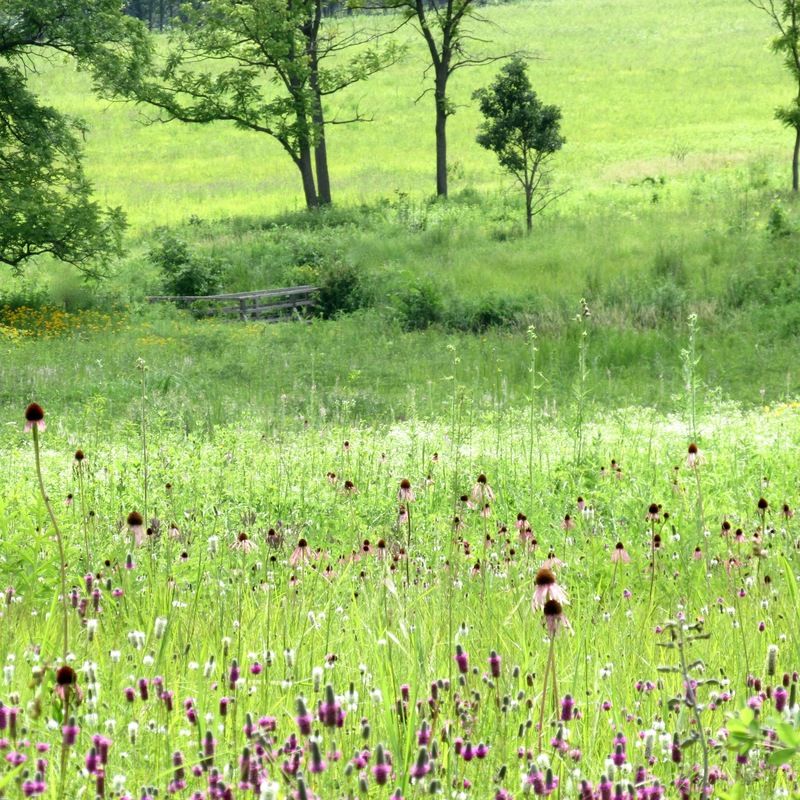 With a little purple prairie clover. 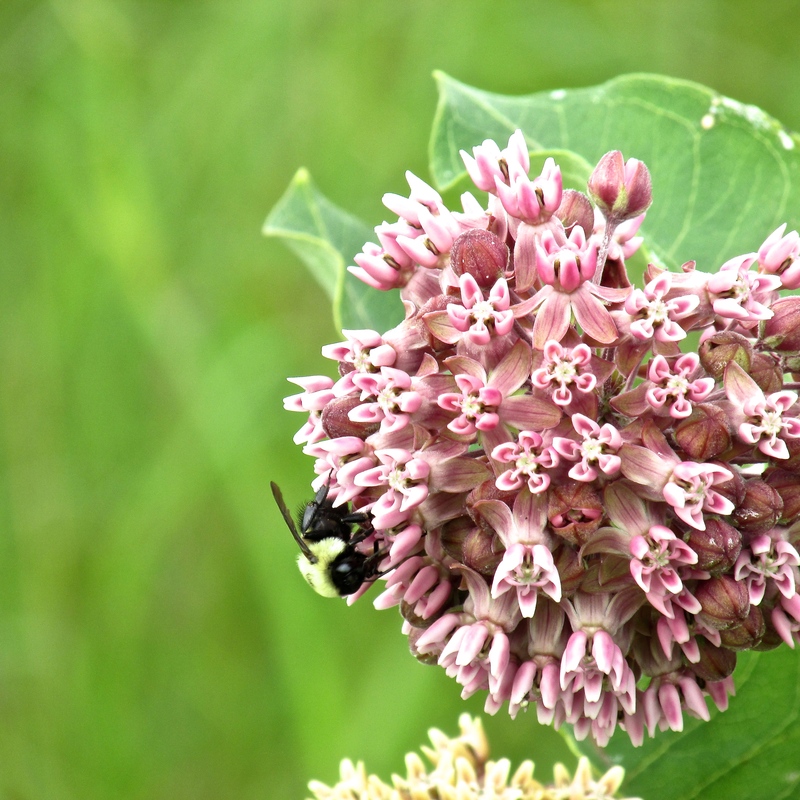 All these milkweeds have one thing in common: They are the host plants for monarch butterfly eggs. 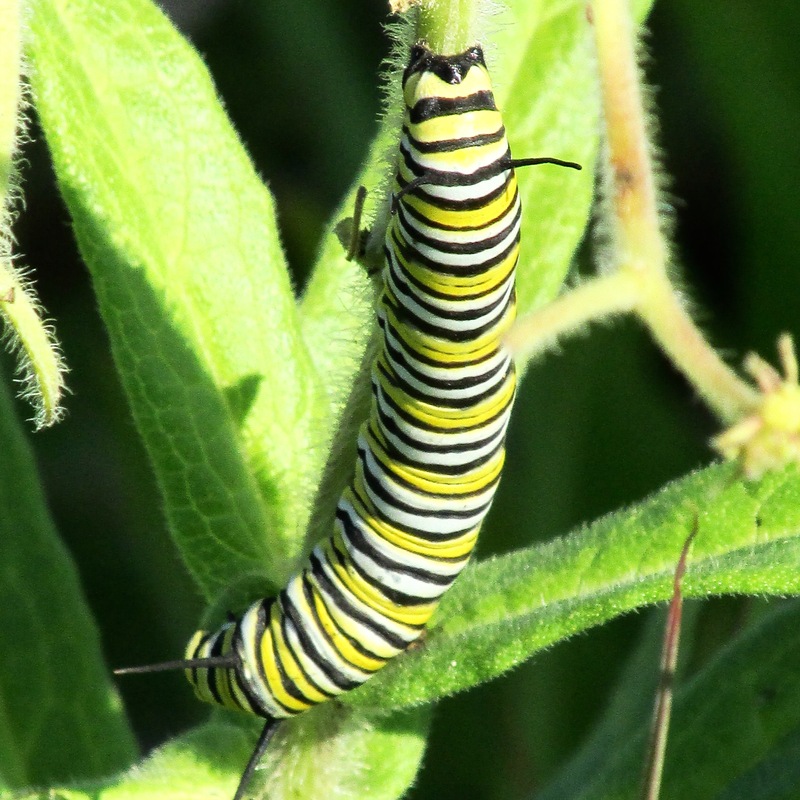 Once the caterpillars hatch, milkweed plants provide them with life-giving nourishment. 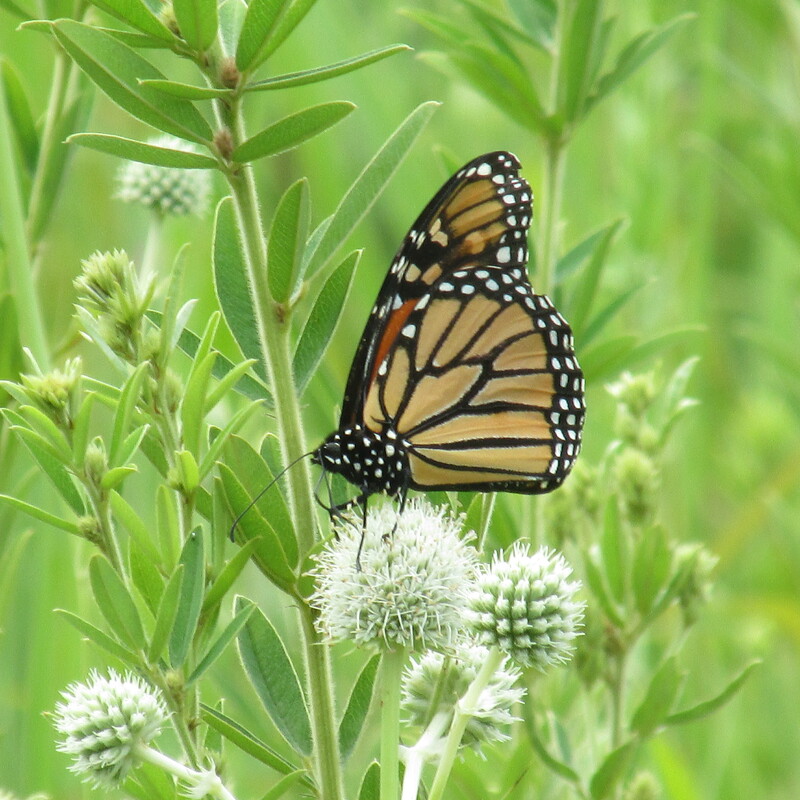 No milkweed = No monarchs. Don’t have a backyard, you say? 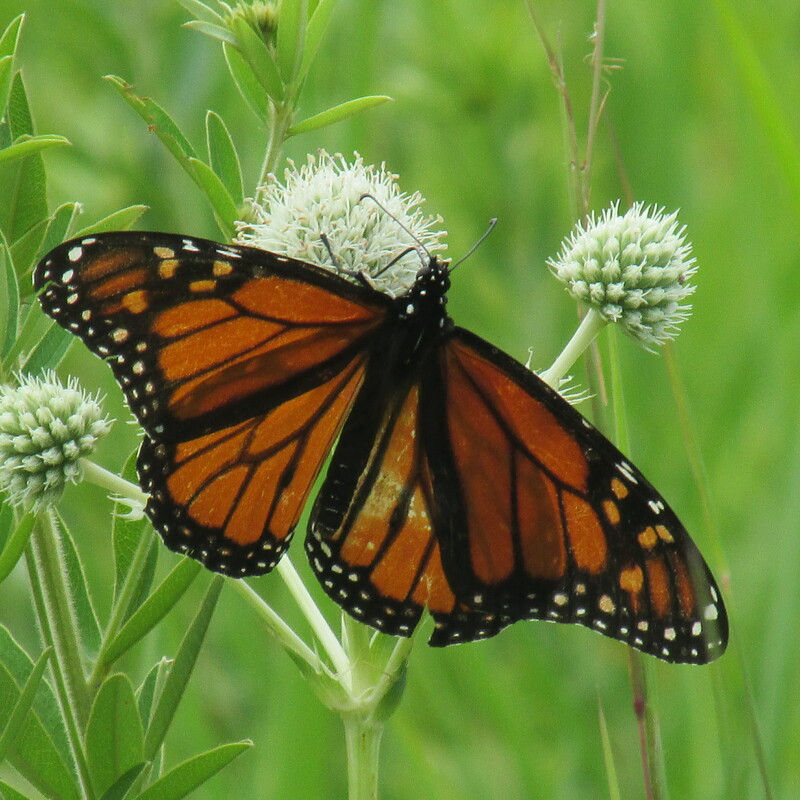 Help restore a prairie or plant a butterfly garden with milkweed in a city park, and you’re helping the monarch butterflies. I know, I know. 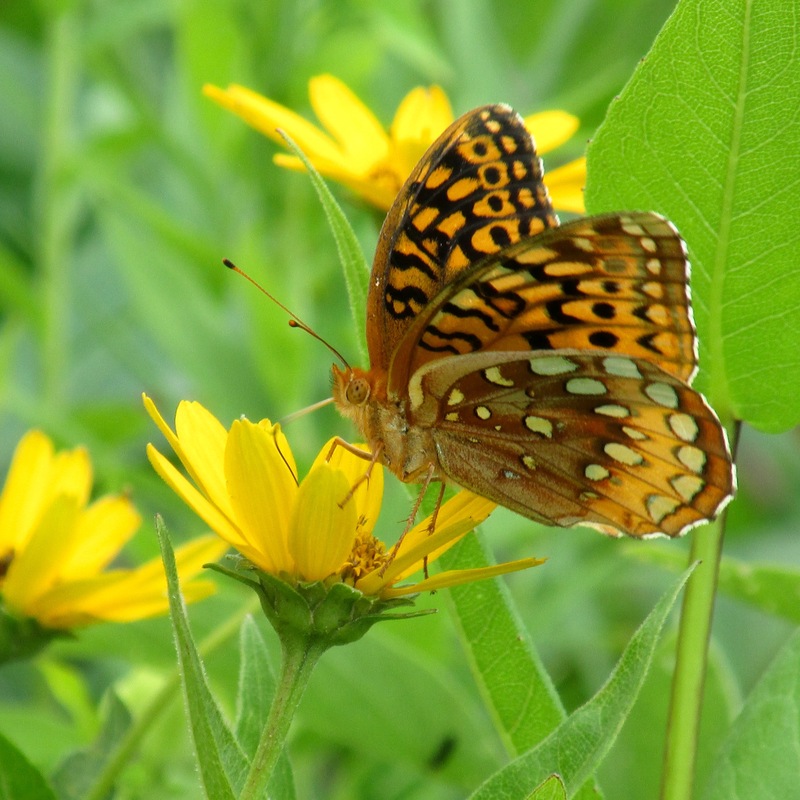 Restoring a prairie or planting milkweed in our backyards and neighborhoods is not going to solve some of the big problems that our world faces. 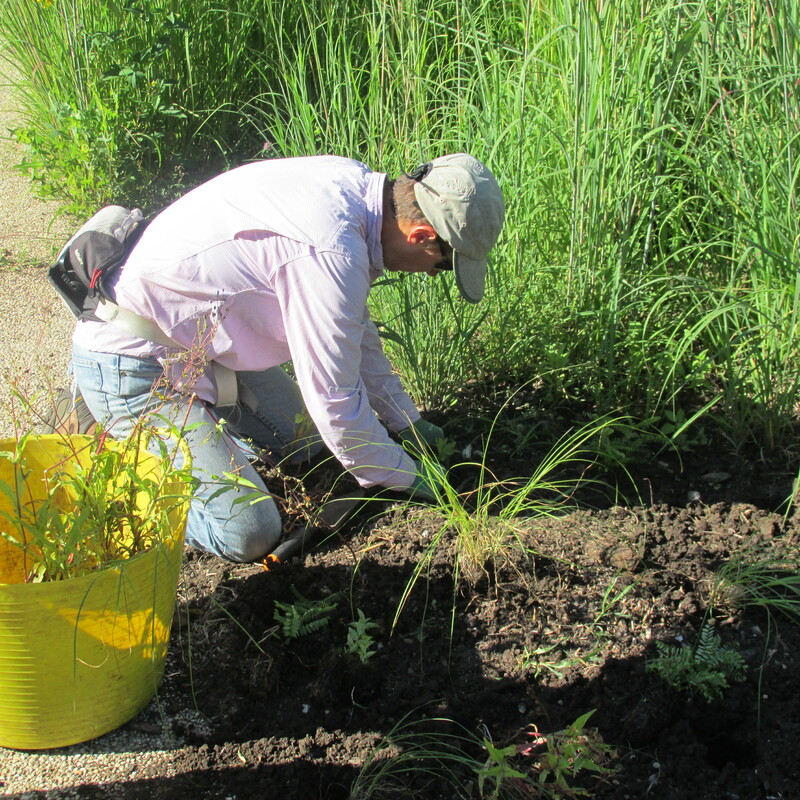 But each milkweed plant is one small step toward hope. One way to make a tangible difference where we live. One tiny spark that can ignite a sky full of butterflies. Do we want to passively accept another loss of something fleeting and lovely? Not all of us can do great things. But we can all do small things with great love. The small changes we can make give us hope for greater changes we can’t make alone. If only all the solutions to our problems began with planting more flowers. 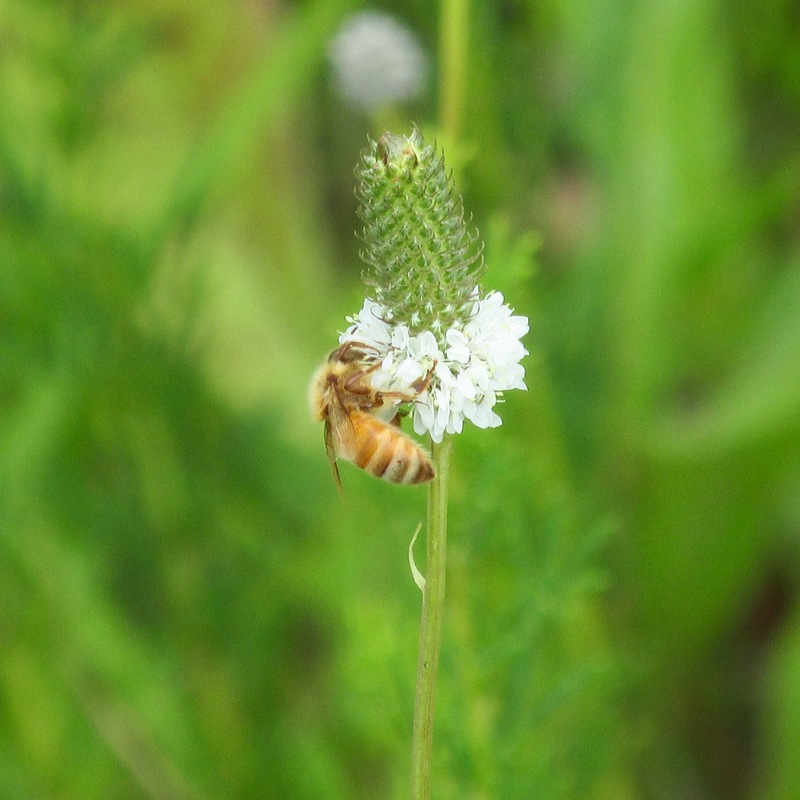 All photos by Cindy Crosby: (top to bottom): bee on common milkweed (Asclepias syriaca), Nachusa Grasslands, Franklin Grove, IL; monarch butterfly on rattlesnake master (Eryngium yuccifolium), Schulenberg Prairie at The Morton Arboretum, Lisle, IL; whorled milkweed (Asclepias verticillata) , SP; butterfly weed, SP; monarch butterfly caterpillar on butterfly weed (Asclepias tuberosa) , SP; volunteer restoring tallgrass prairie, SP; monarch butterfly on bee balm (Monarda fistulosa), NG; monarch butterfly on rattlesnake master (Eryngium yuccifolium), SP. “Do small things with great love” quote is adapted from Mother Teresa (1910-1997). 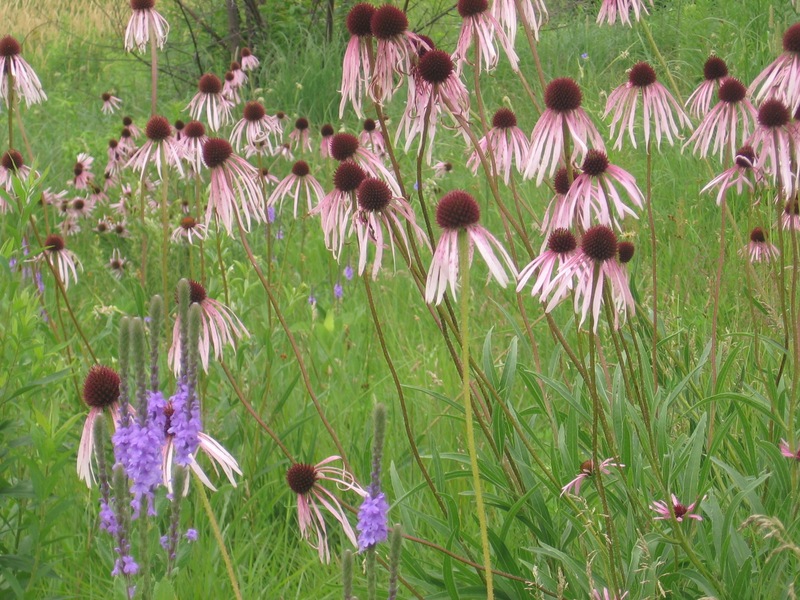 If you’re going to color a prairie landscape, reach for your box of crayons. Chocolate brown for the bison. 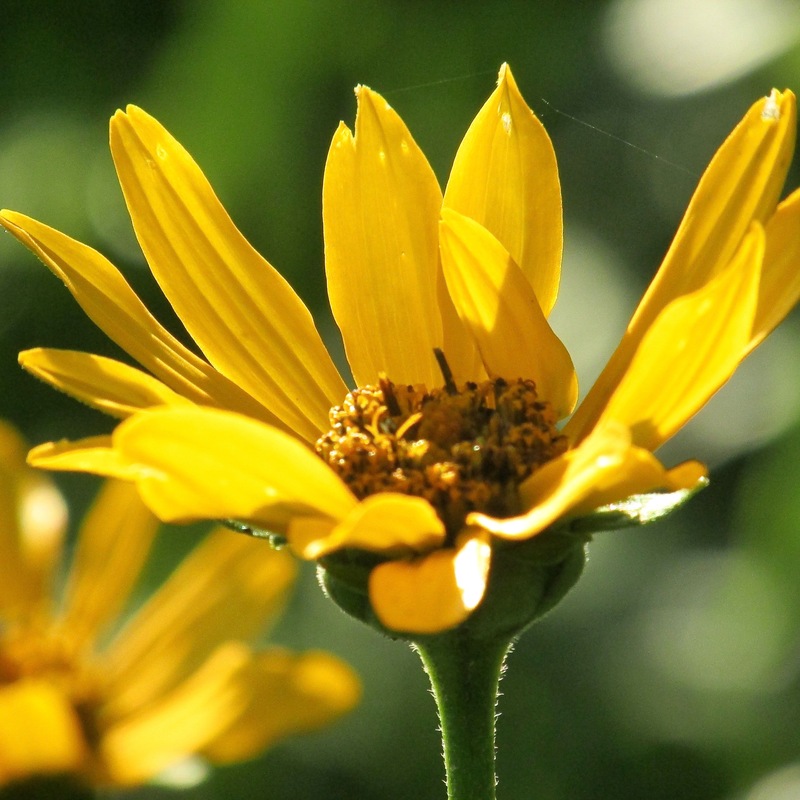 Butter yellow for the prairie coreopsis. 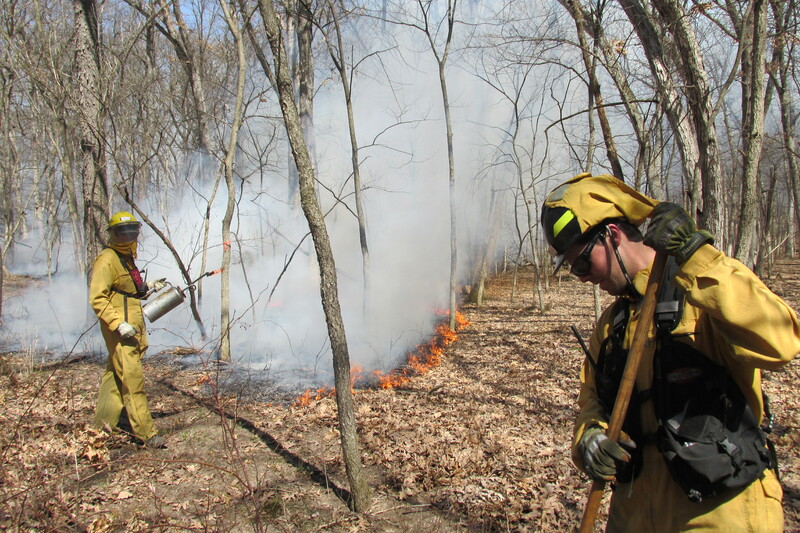 Or a slightly smudged, battered yellow crayon for the prescribed burn crew’s jackets, as they set fires that keep the prairies and savannas healthy. (You’ll need the orange crayon for the flames). 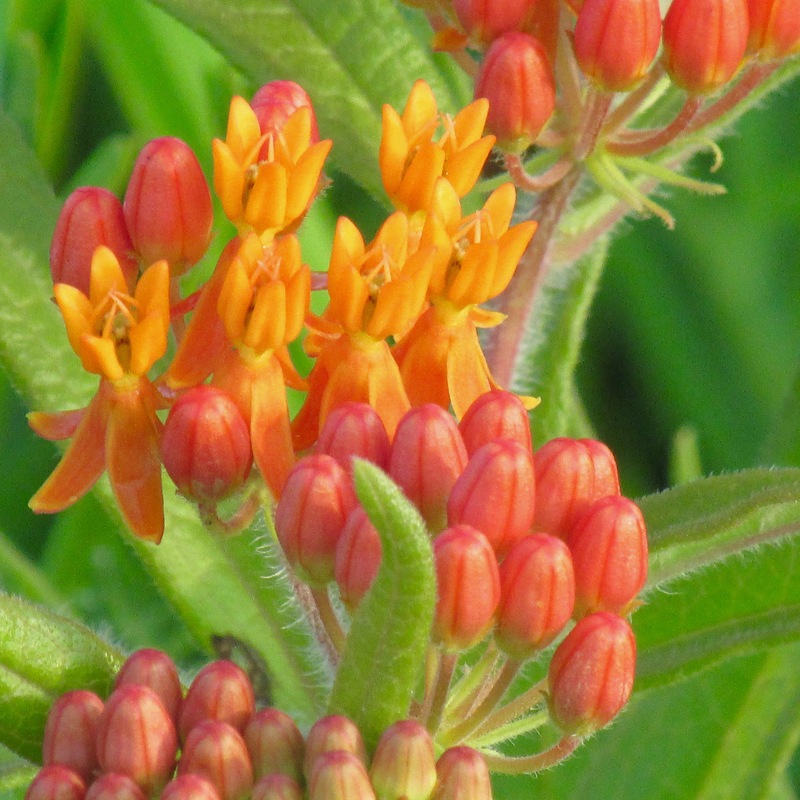 Keep that bright orange crayon out– you’ll need it for the butterfly weed. 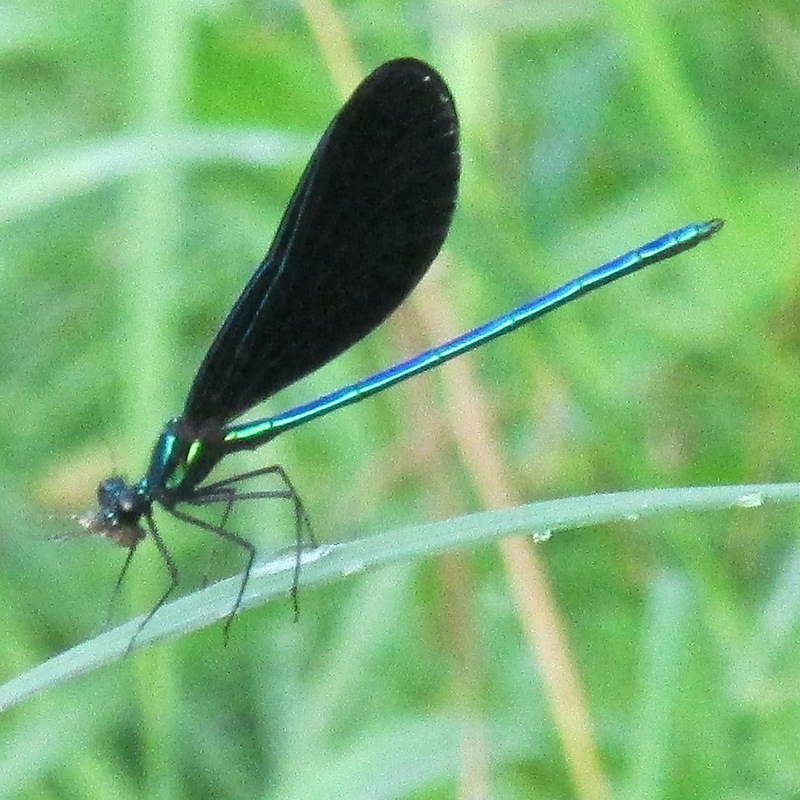 Black for the ebony jewelwing damselfly’s wings. 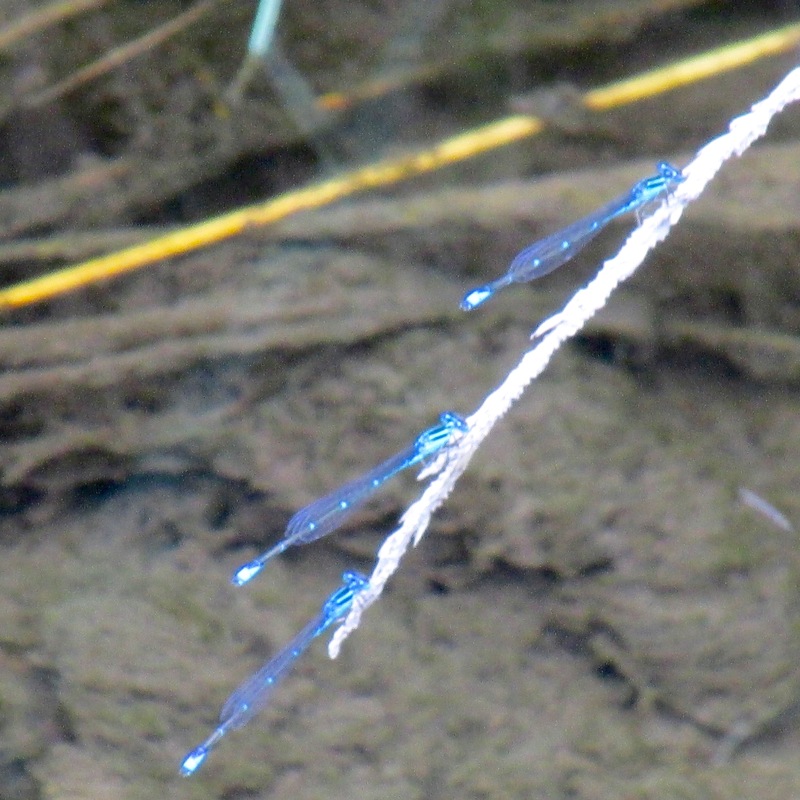 Iridescent green, for the rest of his body, if you can find it. (You might need the big box). 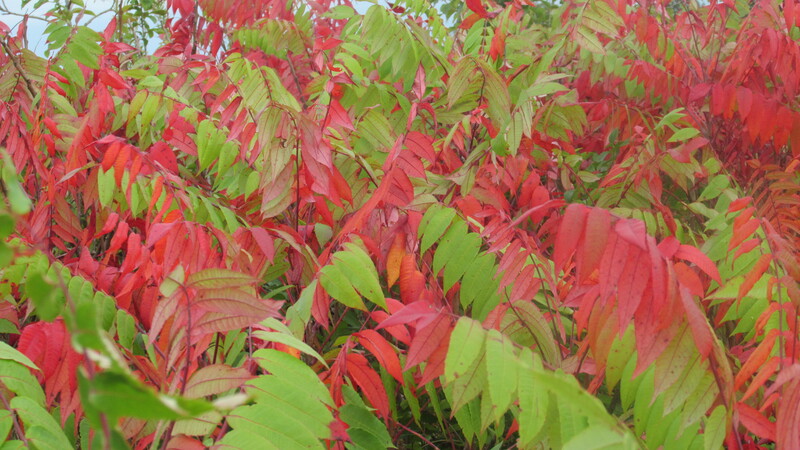 The scarlet and lime green crayons for sumac in September. 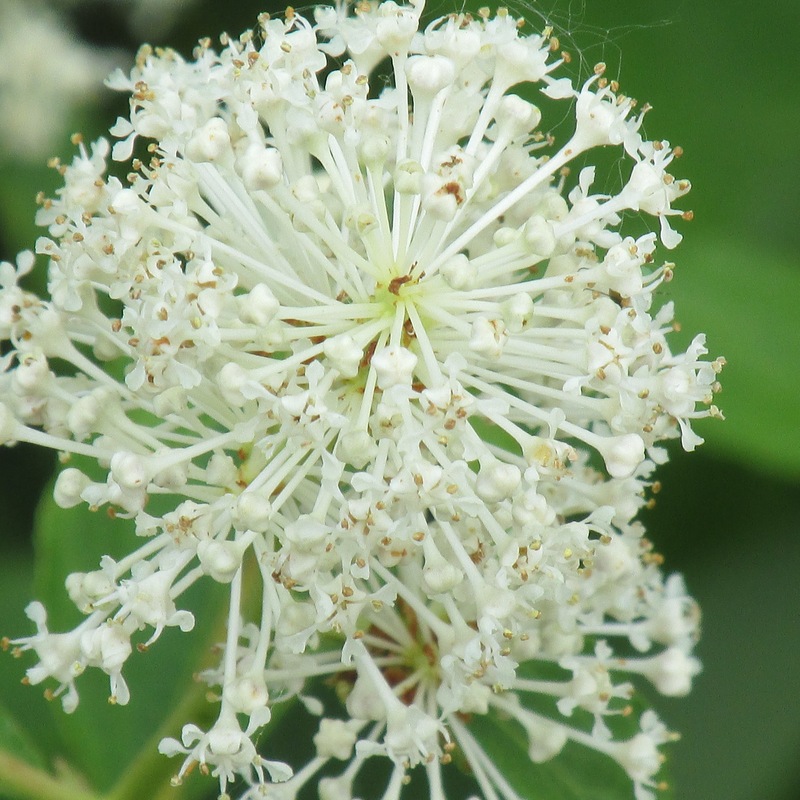 Contrasted with the pure white of the New Jersey tea flowers in summer. Press hard, or the white won’t show up. 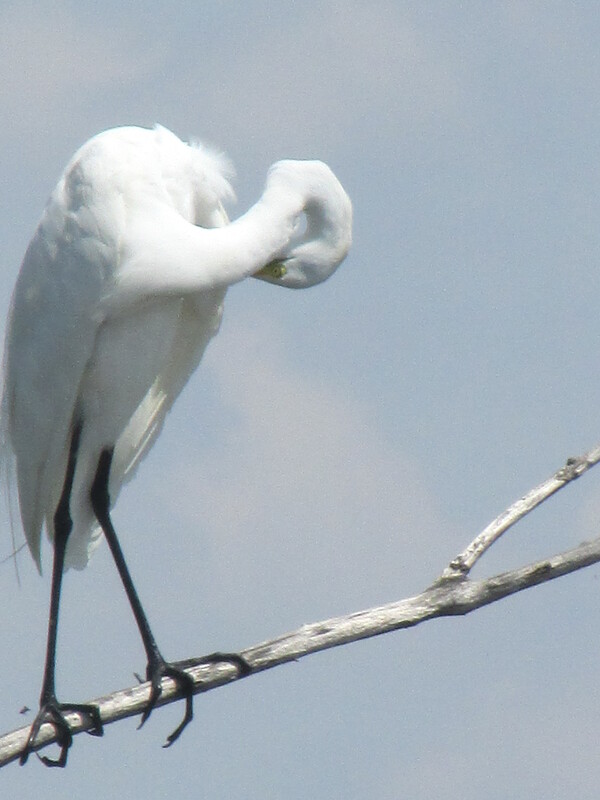 The softer white of a great egret. 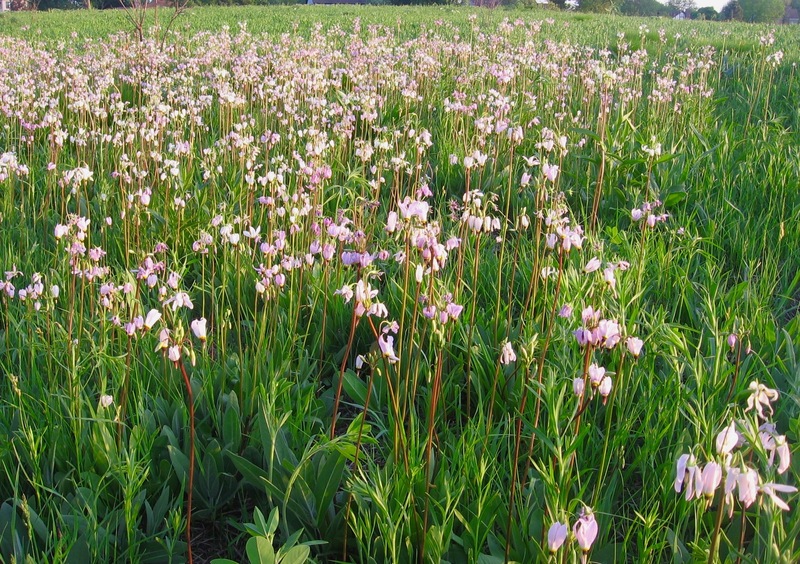 The pale pink of a thousand shooting stars in spring. 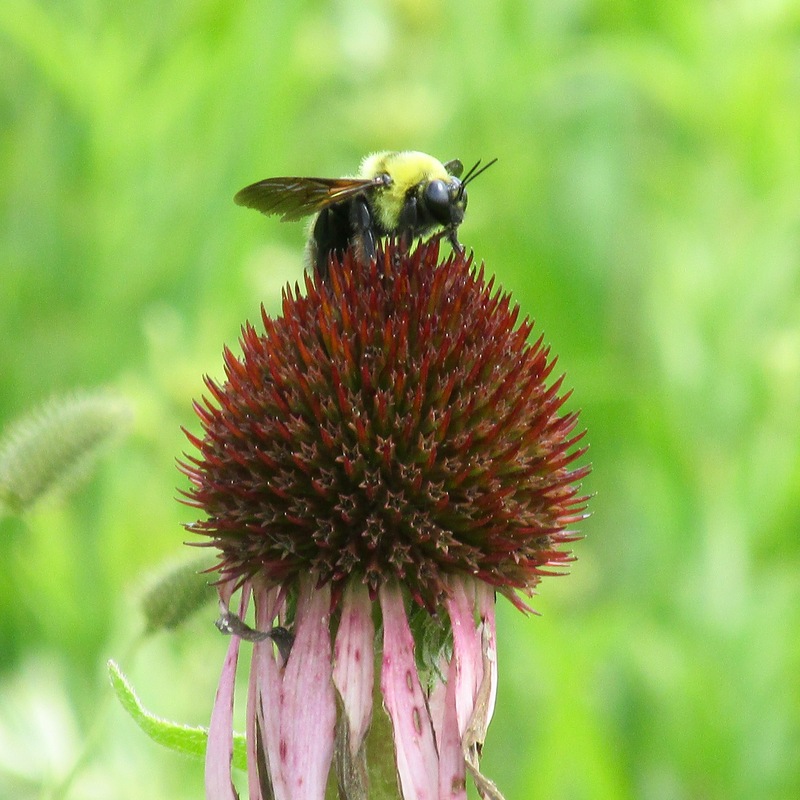 Shade the pink with the lightest lavender crayon in the box for the pale purple coneflowers of summer. Add more intense purple for the vervain. Take out the sky blue crayon. Use it generously. 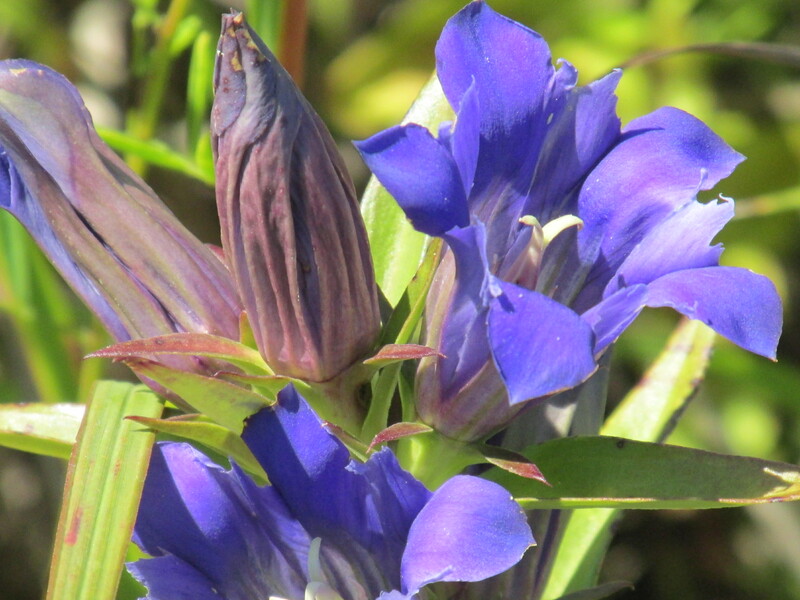 Add some violet to the sky blue, reflected in the rich color of gentians, nestled deep in the grasses. 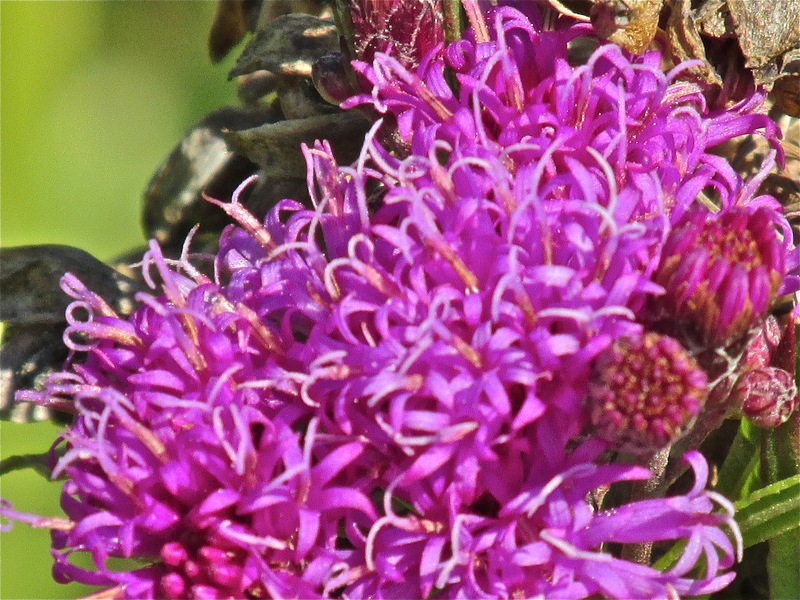 Then, scribble magenta for the ironweed of autumn. 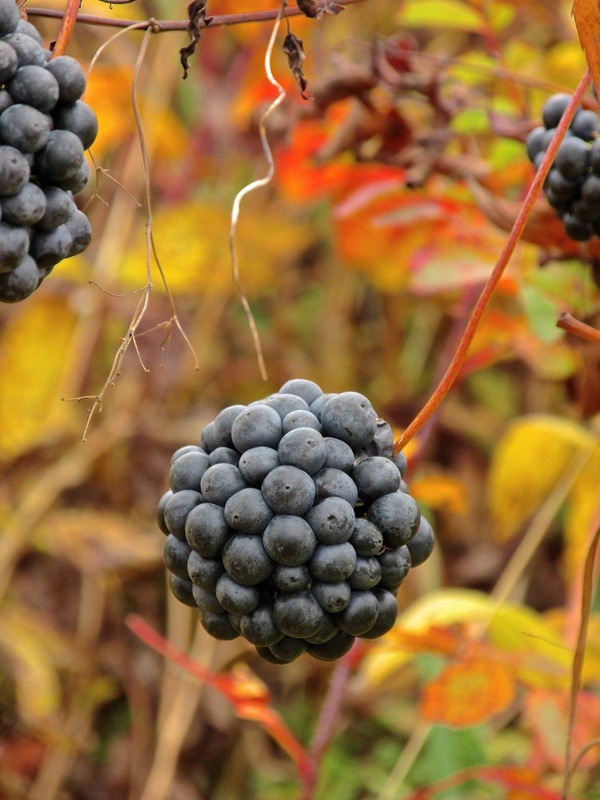 Followed by the dark navy globes of the carrion flower, gone to seed, winding through the tallgrass. Shade the globes with purple and black. You’ve only pulled a few of the many crayons you’ll need to color the prairie landscape from your prairie crayon box. (All photographs by Cindy Crosby (top to bottom): bison, Nachusa Grasslands, Franklin Grove, IL; prairie coreopsis (Coreopsis palmata), Schulenberg Prairie at The Morton Arboretum, Lisle, IL; prescribed burn crew, NG; butterfly weed (Asclepias tuberosa), SP; ebony jewelwing damselfly, NG; sumac, NG; New Jersey tea (Ceanothus americanus), SP; great egret, NG; shooting stars (Dodecatheon meadia), SP; pale purple coneflowers (Echinacea pallida), NG; road to the sky, NG; gentians (Gentiana puberulenta), SP; ironweed (Vernonia altissima), NG, carrion flowers gone to seed, NG (Smilax herbacea). 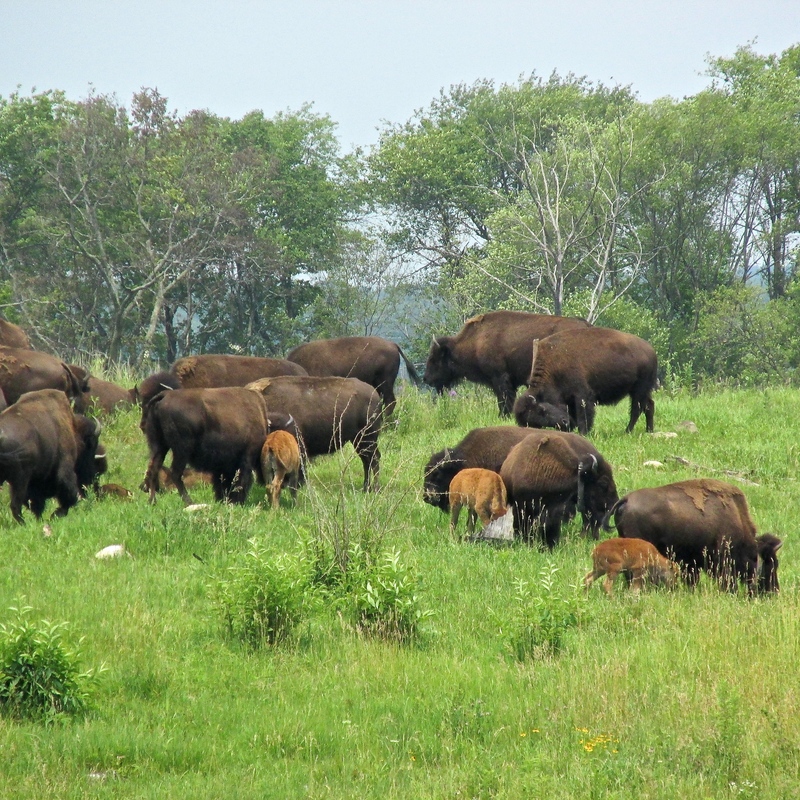 At Nachusa Grasslands in Franklin Grove, IL, the main July attractions are big. 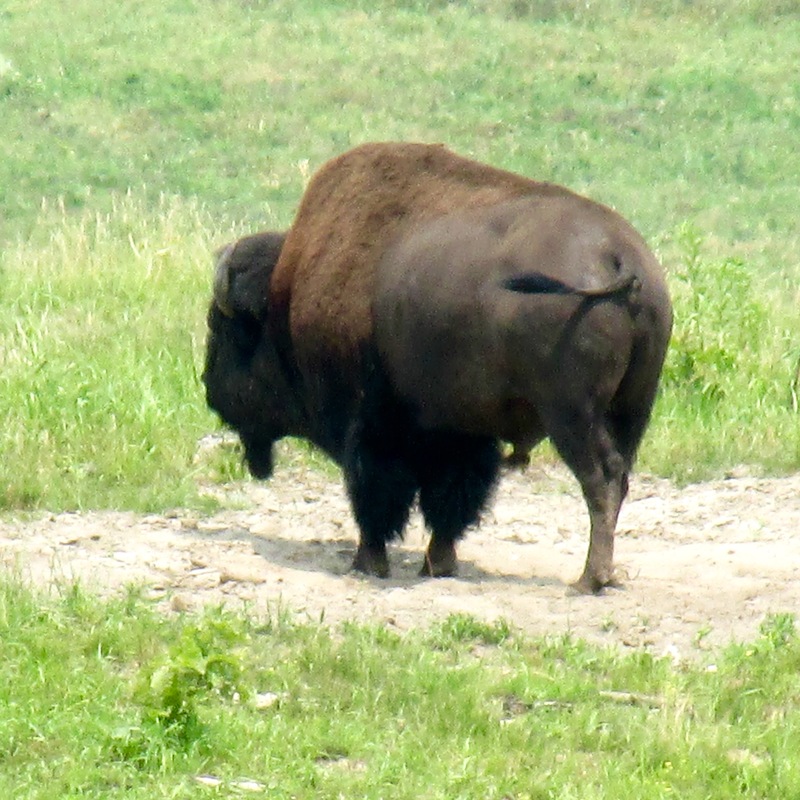 The charismatic bison continue to draw crowds of people eager to see ghosts of the prairie, now resurrected. 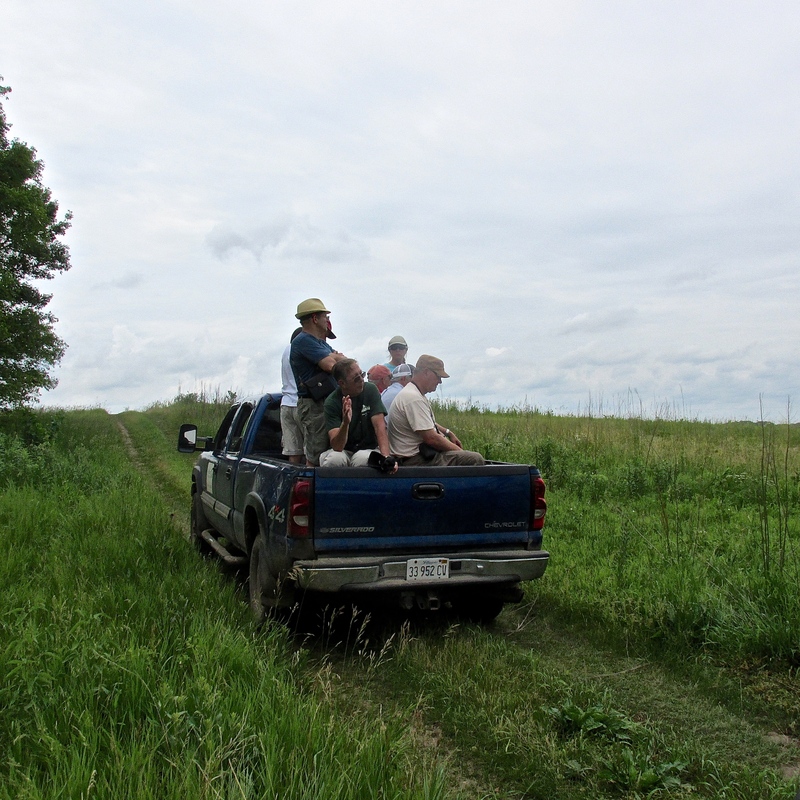 Visitors hop into pickup trucks for tours; pull their cars off alongside the bison fencing and peer through binoculars. 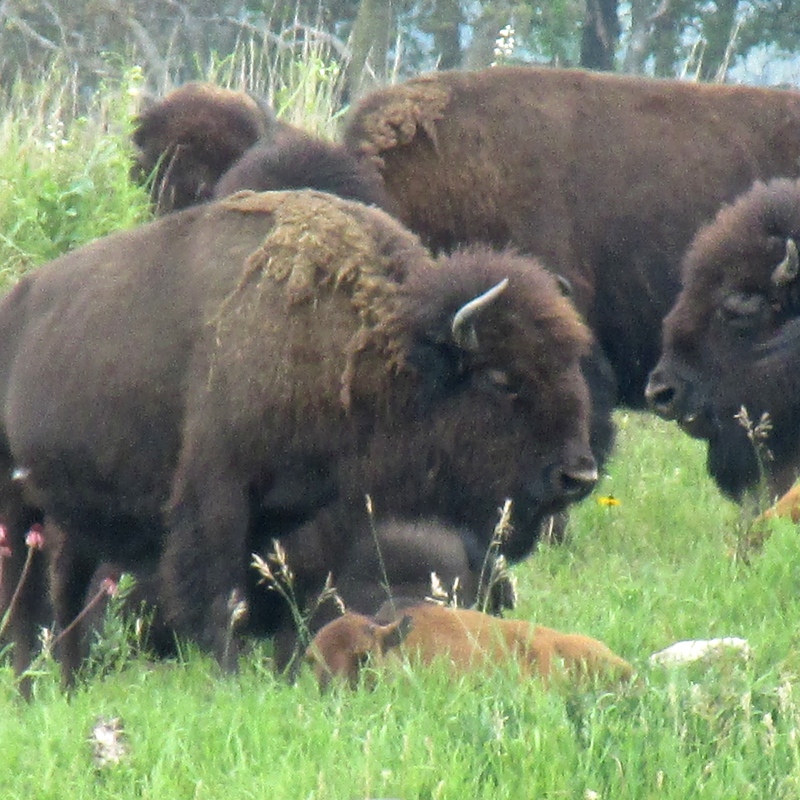 The 14 baby bison born this spring are icing on the proverbial prairie cake. Rock stars, with their own set of paparazzi. 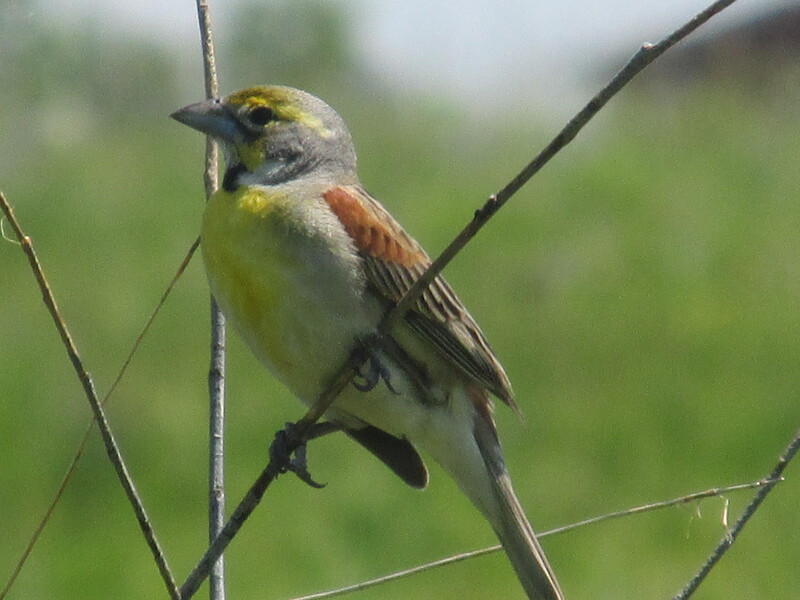 When the focus is on these shaggy denizens of the past, it’s easy to overlook the less visible gems of the prairie. 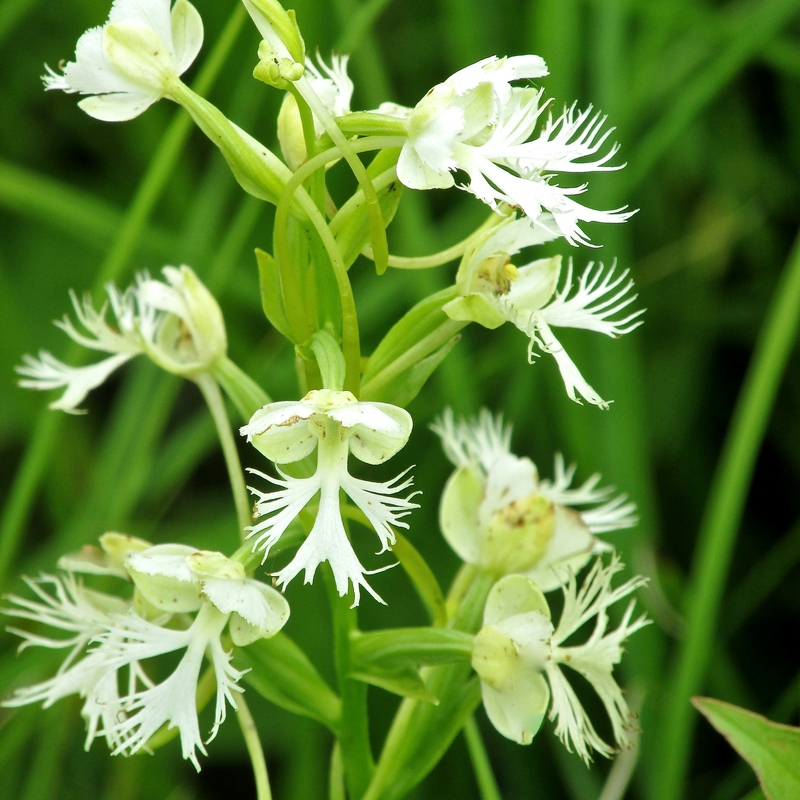 Like this federally threatened eastern prairie fringed orchid, half-hidden in the grasses. 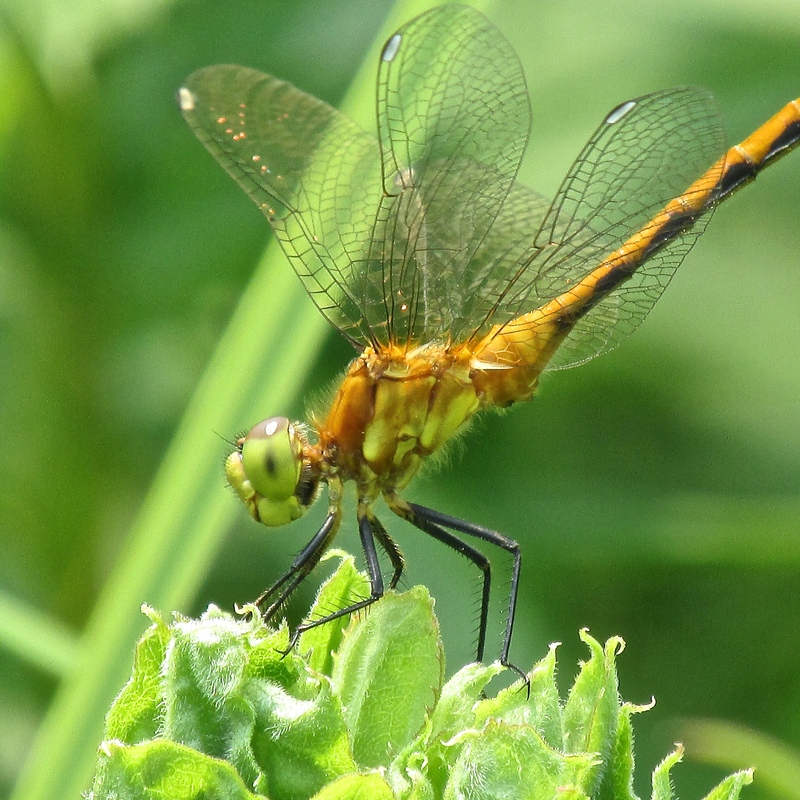 Or the dragonflies, including this white-faced meadowhawk, which weighs barely as much as a whisper. 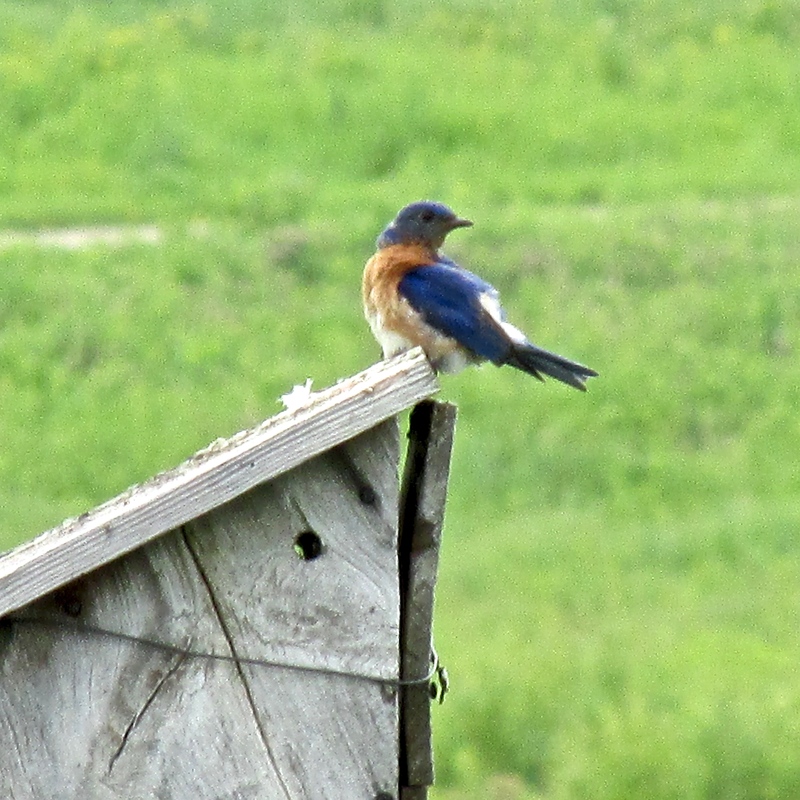 Bluebirds stand sentinel on their tiny wooden houses. They and the almost 200 species of birds here are a tribute to the work of restorationists, who didn’t forget the little things. 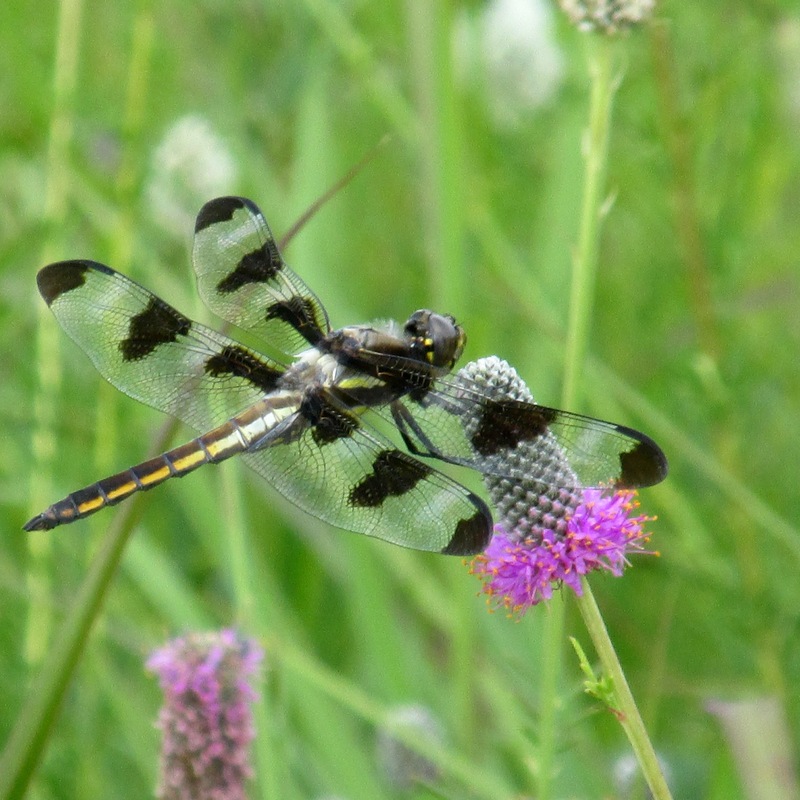 We need the bison and the bluebirds; orchids and dragonflies. 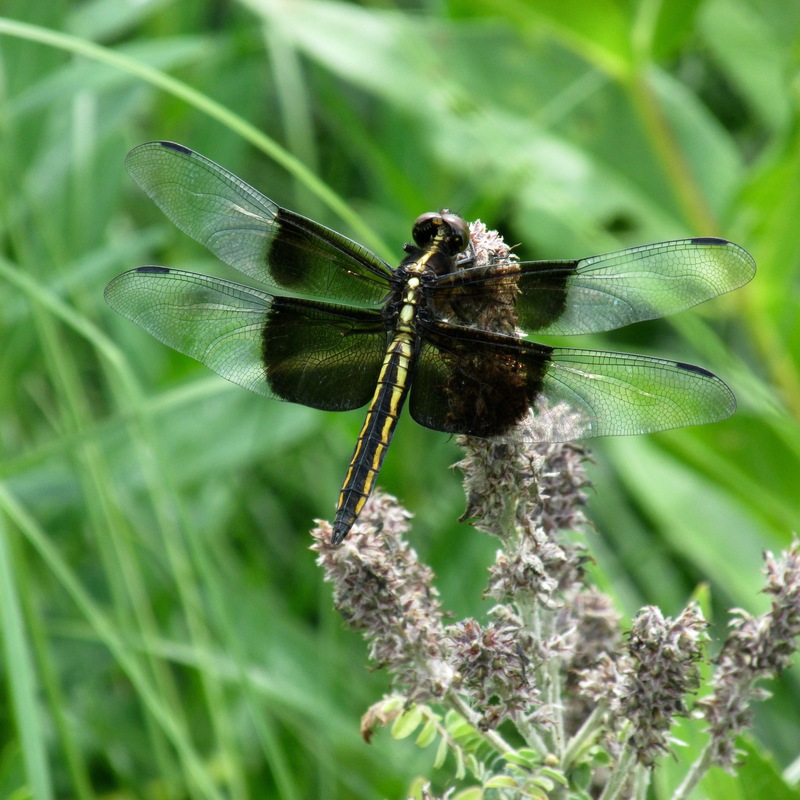 Mammals and birds, plants and insects. The great and the small. There is beauty in the aggregate. 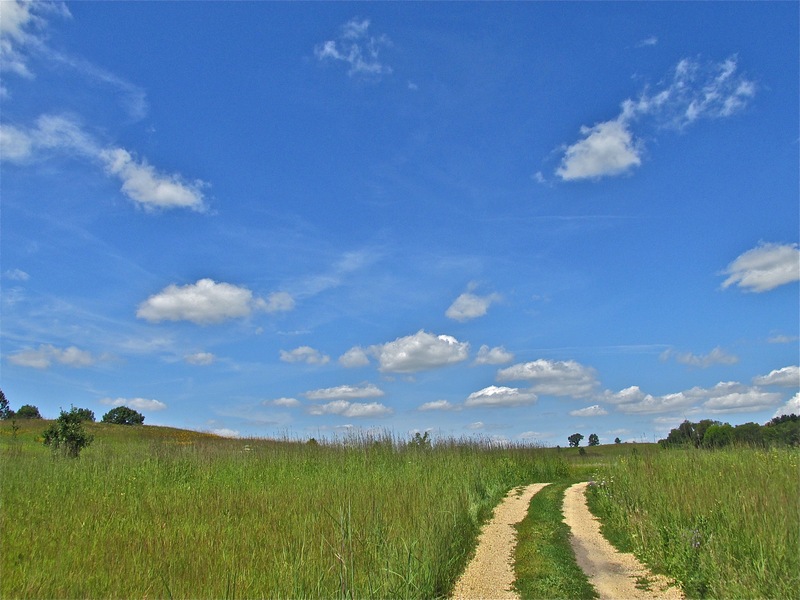 Alone, each plant, animal, bird and insect — with a thousand other big and small members of the tallgrass prairie– create an irreplaceable landscape. 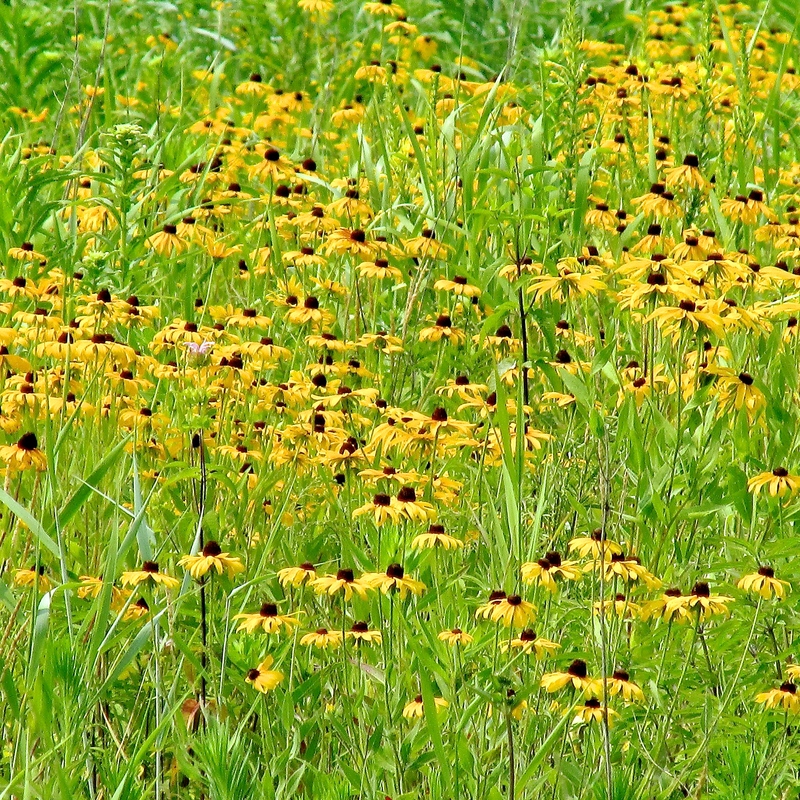 All photos by Cindy Crosby at Nachusa Grasslands in Franklin Grove, IL: (top to bottom) Bison; bison tour; bison with babies; eastern prairie fringed orchid (Platanthera leucophaea); white-faced meadowhawk; eastern bluebird; black-eyed Susans (Rudbeckia hirta); Michigan lily (Lilium michiganense).